A squad of seven Chichester athletes travelled to the Sussex Under-15 League fixture at Horsham – the last of the west-division meetings before the Sussex grand final at the end of August. Once again Ollie Beach and Millie Grant, the club’s most consistent performers of the season in this age group, led from the front, aided by valuable contributions from the rest of the squad. In the hammer, the Chichester athlete was up against two of the top five throwers in the UK, from Worthing and Crawley, but held her nerve to record 20m-plus. Beach comfortably won the discus with a throw of 38.76 and was again over 10m in the shot, backed up well by Jack Wadham, who won both B-string events. But it was the 300m which most pleased Beach, running sub 40 seconds for the first time with a time of 39.8sec, just getting pipped at the line by a fast finishing Worthing athlete. Sprinter Tom Bentley was again in good form in the sprints with times of 12.8sec and 26.3sec for the 100m and 200m and a solid long jump of 4.65. For the girls, Grant managed 9.19m in the shot and followed that with a 16.88m discus effort. Nicole Boltwood and Emily Weymouth opted for a change to their usual events and after good 300m runs lined up for a competitive 1500m. Nina Moranne, after her recent triathlon success, had a greater change from her usual 1500m by lining up in the 200m, 800m and adding a long jump for good measure. The 400m runner Ollie Smith donned his Sussex vest for the inter-counties event at Sportcity which also doubled up as the British championships. Smith has been getting back to near his best this season after coming through a couple of injury-hit campaigns and was delighted to make the final with a tough schedule of three races over the weekend, all with sub 49-second clockings. He achieved a season’s best of 48.23 in the heats and battled well for a fourth place in his semi-final to make the final. Although Smith could not quite match his heat time in the final, this still represented a major step towards going under 48 seconds for the distance. 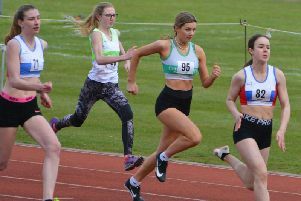 In a well-supported open meeting at Crawley, three Chichester athletes lined up against opposition from all over the south in a series of nine 800m races. Using the graded system of athletes’ previous best times regardless of age, Liam Dunne found himself in the top race which set off at a fast-but-not-overambitious pace of 57 seconds for the first 400m. On another very warm evening, the 15-year-old from Chichester had to force the pace in the final stages to come home alone in 1.59.04, which was not quite a personal best but made him the only athlete in any age group to break the two-minute barrier. In race five out of the nine, Fionn O’Murchu battled well against older athletes to cross the line in 2.32.5 while Josh Dunne kept up the family’s good form by winning race six in 2.32.5. There was triple success for Chichester in last Saturday’s local parkrun events. James Baker and Alice Cox-Rusbridge were first male and female to finish in the Bognor event, both recording times not far outside their PBs. Baker’s 16.20 was just nine seconds outside his best on the course and 19.35 for Cox-Rusbridge was only seven seconds slower than her best mark. Both were well ahead of their nearest rivals. Meanwhile at the Oaklands Park parkrun in Chichester, there was a popular first runner home with the first race director Mike Houston crossing the line in a speedy 17.26. The large field in the latest West Sussex Fun Run league race at Henfield, the Seven Stiles four-miler, were thankful for the cooling rain and took advantage of the best conditions for several weeks. There was once again a female runner, Lucy Thraves, who led home the Chichester contingent, beating all her male club-mates in the process. Her tenth place overall placed her first in the women’s race and she was one of three Chichester Runners to pick up a maximum ten bonus points. What made this a first for the club was that the other two were also two of the club’s in-form women with Emma Hughes in ninth and Emma Wickens 14th, easily making the top 20 for their points.